Once again I apologise for my long delay in posting. I've had some moving problems (new house yeah!) along with my computer deciding to die. However, enough of the excuses, onto some stuffs! So, welcome to a new article series that I'm starting, surprisingly entitled 'Know your enemy'. What I'm going to do is focus on a unit/model that you may not be aware of or that may be complicated to face and describe what it is, how it is best used and what you can do against it. So I'm going to start with a new favourite unit of mine. The Shadow Spectres. Well, for starters they are a Forgeworld unit. One of the greatest joys I've found in starting Eldar, is that Forgeworld has opened to me. The Space Marine units they develop (whilst lovely) are mainly variations of power armour, or tanks that we already have (eg Spartan Assault Tanks = Land Raider variation). For the Xenos however, Forgeworld are developing new units (Necron Tomb Stalkers/Acanthrites, Tyranid Malanthropes, Tau Drone Stealth Fighters etc etc). New. Exciting. Fun. And here lies the Eldar Shadow Spectres. Of course though, you won't see them that often because not everyone uses/allows Forgeworld units. This makes them a perfect subject for the first article however. Disguised behind shimmering holo-fields, draped with gossamer-thin robes and wraith-like in appearance, the Shadow Spectres were believed long lost by Eldar Seers. Armed with prism rifles, each a potent anti-tank weapon, and equipped with jet packs, their moility allows them to hunt down their chosen targets with the implacable patience of the dead, materialising seemingly from the very air to unleash theur overwhelming firepower. Once a disciple of Asurmen, first of the Eldar Phoenix Lords, Irillyth the Shade of Twilight founded the Shrine of the Shadow Spectres on the Craftworld of Mymeara. Drawn to the small Craftworld in response to a vision of doom and horror, Irillyth gifted the skills of stealth, swiftness and all-consuming firepower to the warriors of Mymeara. After many years the Phoenix Lord led a great war host to the legend-shrouded world of Bethalmae to destroy a race that would, many thousands of years later, arise to threaten Craftworld Mymeara. Neither he nor any of his warhost ever returned to the Craftworld, and with the lossof their Phoenix Lord, the Shadow Spectre aspect fell into decline. So they are a lost Aspect from Mymeara. That explains why we don't see them a lot I guess. I love this background though, it's very cool. So first off, what do they do? What are their rules? They're basically a cross between Dark Reapers and Warp Spiders in terms of firepower and mobility. They trade some of the punch of the Reapers for some Jet Pack fun. They have standard Aspect warrior/Exarch stats with a 4+ save. Their guns are essentially small Fire Prisms. They either fire a S4 AP4 blast or a S6 AP3 lance shot with something called Ghostlight (I'll cover this in a moment). This means their pretty competent at tackling both hordes and vehicles (both light and heavy). This makes them a fairly rare thing for an Eldar aspect, flexible. They come stock with Haywire grenades to effectively dismantle any vehicle they get close to (if it's not already busted by then) and the Exarch can either take a Haywire Blaster (to fire 2 Haywire shots a turn) or a Prism Blaster (a tasty Heavy 2, S7, AP2 gun). Ghostlight. This is the most complicated bit. When shooting their S6 shots, they can choose to exchange all their hits for 1 hit, which is boosted. Basically, they can up the S or drop the AP (by one) for each hit they score at the first. This means that a unit of 5 can generate a S9 AP2 Lance hit. Pretty tasty. This also applies to the Prism Blaster on the Exarch, and with 2 shots at BS5 he should hit with both most of the time. Bear in mind though, it boosts the majority gun profile to boost. So most of the time they will be boosting a S6 AP3 shot. With this however, they can get some very nice hits on heavy tanks (never forget Lance. Dropping the AV to 12 is a very big help for this shot). They have Jet Packs.This makes them relentless (so ignore the heavy status of their guns). They can also mover 2d6 in the assault phase. This means they can move into range, then Battle Focus (they have this now) and Jet Pack away. Putting them 3d6 (on average 11") away. If they were at maximum range, they will then be 29" away. With an above average roll they will be out of maximum bolter range of infantry. So they're pretty hard to catch. They can deepstrike, shoot, run, then Jet Pack in the same turn. Lightning strike right there. Imagine this unit popping up behind your Aegis Line, dropping 5 S4 AP4 blasts on you and then scooting away. Ouch. Their Spectre Holofield is basically the same as normal Holofields now. They gain a 5+ cover when moving, and a 4+ if they've Jet Pack assault moved. This makes them decently survivable as they don't need to worry about being in terrain to get a save. My final point is on the Exarch power Shadow of Death. This is a 20pt upgrade that makes all enemy units with 12" roll 3d6 for Leadership/Morale tests and pick the two highest. So this makes all ENEMY (not friendly units--unlike the Hemlock...) very susceptible to running from combat, being pinned and failing psychic tests (admittedly psykers often have high leadership but Shadow of Death does affect this as it is a Leadership test). The Spectres also cause fear, so combining the two, units assaulting them may find themselves reduced to WS1. Vastly improving the Spectres survavability. So yeah. That's quite a lot. They're a fairly complex unit. So how can we best use them then? If I need to scrimp, H&R is the first to go (whilst it's good to stop them getting pinned in combat where they do NOT want to be, I figure if they get charged, they'll mostly be being killed/heavily depleted anyway), then one of the guys will go (making them 4 man). I would rarely run them at less than 4 guys. The reason for this is Ghostlight. Their effectiveness at busting tanks with Ghostlight drops fairly heavily after 4 guys. The exarch with Blaster is important as he has 2 nearly guaranteed hits to boost the shot. Also AP2 is always nice if you want to force saves on Termies (with blasts on the other guys). Also, Shadow of Death is amazing, but to force those Morale checks you need to be able to cause enough casualties, otherwise this power isn't going to get that much use (and at 20pts it's quite dear). Generally, I will Deep Strike these guys to keep them from getting shot early on. Also with an 18" range, they're fairly short ranged and Deep Strike gets them there straight away. An Autarch is good to make sure they arrive on time, but you could run them normally if you wanted. They are still quite fast and should be able to get into range quickly, I just think that dropping such a dangerous, flexible unit right where the enemy doesn't want it is very useful. Particularly if you can get lots of enemy units into Shadow of Death range and start pinning them (hello rangers). They can tackle whatever needs tackling, a flexible aspect is very useful to have. Flexibility is a big selling point of the Warp Spiders (what aren't multiple S6/7 shots not good against?). So that's how they can be used to good effect. Now, what can we do against them? Well, they're Eldar Aspect Warriors. Never forget this. At the end of the day they are still T3 4+ (armour/cover) infantry. They will drop to any kind of firepower (eg bolters, lasguns...you get the idea). The problem is catching them. Well, first off they have no Deep Strike assistance. No reduced scatter or anything like that (unless they Eldar warlord rolls the 'no deep strike scatter within 6"' Warlord trait, and then gets near your lines). Therefore if you bunch up (or at least cut down on large gaps in your deployment that scream "Drop down here!") they will have trouble getting them in without scattering and mishapping. This will often force the opponent to place them closer to their own lines, and then they're stood in front of your guns, not ranging around your backfield freely. Of course, sometimes this isn't possible to prevent (those 'hit' rolls on scatter dice do crop up sometimes. When it's not me rolling them of course). In this case you should be able to shut down their move in your deployment with something. It will cost you a turn to bring something back but as I mentioned even a guardsmen squad can make a serious impact in their numbers. They can only be in a max squad size of 6 and are very expensive (30pts a guy) so there won't be that many to kill. Also if you can get them in combat, do. Shadow Spectres are not good in combat. Just grit your teeth and bear their shooting for a turn and then take them down with small arms fire. Heavy fire won't be as effective as their cover save will avert 50% of the wounds they take. Also if they survive they can eat vindicators/land raiders/any vehicle really with Lance and Haywire, so a squad of grunts is best for the job. 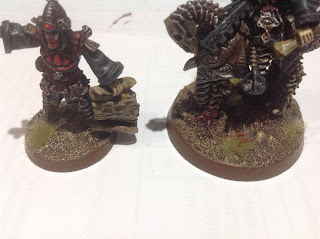 Well I hope this article has been of use to you, even if only because it has drawn your attention to the Shadow Spectres (who are competing with Harlequins for my favourite Eldar unit). If you have any requests for units to analyse then let me know. I hope to run this series for a while (now I have my computer back under control).